Luxury 4 Bedroom, 3.5 Bath Home, Hot Tub! Walk to the Slopes! Welcome to Ruby Retreat! This fabulous 4 bedroom home on the mountain sits on a quiet street with fantastic views and lots of outdoor living space with wrap around decks, a beautiful landscaped yard, stone fire pit, and an oversized hot tub which takes in great sunset views! With luxurious furnishings and room for 10 this home couldn't be equipped better to host your next family vacation whatever the season. 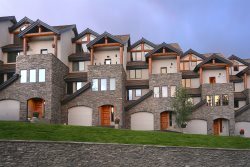 Summer brings fabulous sunsets and a wonderfully landscaped yard, Fall brings panoramic views of the surrounding leaves changing color, and winter puts you on the mountain within walking distance of the slopes! Pull into this home up the long driveway with plenty of parking and take in the great landscaping. There is a stone fire pit outside with large boulders for seating and a flagstone patio with log adirondack chairs to enjoy our wonderful Colorado evenings. Inside on the first level you will find 3 bedrooms and 2 bathrooms for your guests and family. There is a double bedroom and bunk room with 4 twins that share a full bath. Across the hall there is a queen guest room with en-suite bath and TV. Take a trip upstairs and the vaulted ceilings and picture windows looking out to the surrounding mountains will take your breath away. The great room has a gourmet kitchen, large dining area and wonderful living room with Sonos sound system, TV, and gas fireplace. Step out onto the wrap around decks and soak your cares away in the oversized hot tub taking in great views, or relax in the hammock and log adirondack chairs. This level of the home also has the master bedroom with King Bed and spa en-suite bath. Take a look at the custom concrete sink and vanity, it just might give you ideas for your next remodel back home! There is an oversized shower and it all sits behind a custom barn door for privacy. Above the living room and kitchen is hidden loft with comfy chairs and TV to get away from it all. If you are looking for that special home for your family to book year after year then look no further than Ruby Retreat! Working with Iron Horse management was a wonderful experience. Hello, We loved staying at this home for a family get together. The outdoor area is great for outdoor games, and the kitchen is well stocked. Beautiful property, in the perfect setting! The owners are so easy to work with and are great people. I would highly recommend booking this house if you're looking for a place to stay in Crested Butte. You will have plenty of space and everything you need to make your stay easier on the mountain! We loved our time in this beautiful house. It's spacious and comfortable, with really nice furniture and finishes, and a great layout with space for hanging out inside and outside. We also loved the short walk to the ski slopes, which made for easy access to the mountain. The owner was so helpful and very quick to respond to questions both before and during our trip. We'll definitely stay here on our next visit to Crested Butte! We loved Crested Butte...the house was incredible with all the amenities. Not a detail was missed. We have rented a lot of properties over the years and this had everything. Comfortable, well decorated, close to trails for hiking, close to town and amazing views! The owners were so helpful and always available for any questions, even giving us great tips re. Our stay and restaurants to go to. Would definitely come back. Next time to snowboard! We enjoyed walking to the ski hill. The house had a wonderful great room for enjoying dinner together.